It’s been 100 years since the end of the great war. A war that devastated the world and saw millions of lives lost. One survivor of that war was an Australian soldier, Arthur Stace… He returned home to Australia but became an alcoholic on the streets of Sydney. After his profound conversion to Christ he began to write the word ‘Eternity’ on footpaths and walls to remind people of their eternal destiny. He wrote that one word over 500,000 times in his humble crusade to reach people with the Gospel. Today we honour Arthur Stace. We honour the ANZAC’s 100 years on from their battle for freedom. And we share a vision to keep the legacy alive across Australia. 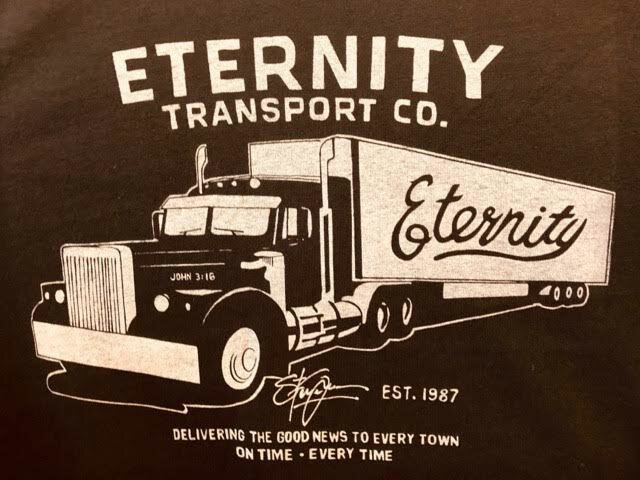 Our vision is for the Eternity Truck. A mobile concert stage that will be used to proclaim the Good News for many years to come. It started out as a Tee shirt design but we now realise God has far more in mind for this image. We want to reach Australian’s with the Good News. We want to see people set free from sin and addictions and despair. We’ve set up a fund raising account for the vision of the Eternity Truck. Help us make this dream a reality.